Some disturbing news on pending unrestricted free-agent center Mike Ribeiro has come out in regards to the civil sexual assault lawsuit from his family’s former nanny. According to On The Forecheck, in court documents filed Thursday, the nanny claims Ribeiro made unwanted sexual advances toward her, dating back to 2007 when the family lived in Texas. She said she started working for the family when she was 12. The complaint specifically alleges that he would stare at her with his hand down his pants, that he would brush up against her and touch her backside while she was doing dishes, and that "sometime around 2009 or 2010, Mike grabbed her leg while he was driving her home." The suit is aimed at Ribeiro and his wife Tamara Williams and a prior report by TMZ said it was for more than $1 million dollars. "No further factual allegations are provided. This is not sufficient under the Federal Rules of Civil Procedure." You can read the entire complaint here, though warning, there is material that is sexually graphic in nature. "We have been made aware of a complaint against Mike Ribeiro, dating back to his playing time while he was in Dallas. Mike has indicated that the charge is without merit and is prepared to vigorously defend himself. We will allow the legal process to move forward without further comment." 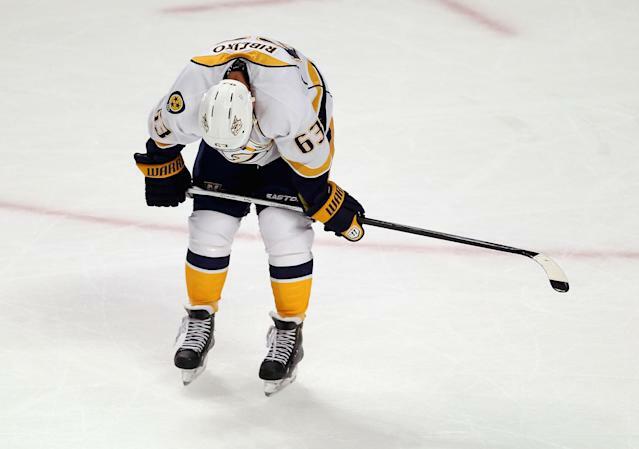 The events in the allegations occurred before Ribeiro joined the Predators last summer. At that time when he signed his one-year $1.05 million deal he was contrite with his past and said he had gone to therapy to seek help with his marriage and troubles with alcohol and drugs. The Arizona Coyotes, who signed him a year earlier, had bought him out and general manager Don Maloney said it had to do with behavioral issues. "My wife and I still go to therapy, and couples therapy. What couples do to get healthy, I'm doing it," Ribeiro said. "The main thing is to keep my (three) children happy. For years I've been talking the talk, but children learn by seeing action and doing what you do. And that's what I do every day, to be a better dad and a better person, a better husband." On the ice this year, Ribeiro, 35, proved an excellent value for the Predators with 62 points. He wasn’t exactly a first-line center, but he was good enough to solidify the team’s offense on its higher lines. Recently Ribeiro’s agent said that a one-year contract would be “unacceptable” to get his client re-signed by the Predators. In the past, Ribeiro has said he wants to make Nashville his post-playing home. Dirk Hoag of On The Forecheck wrote a piece in March, shortly after the lawsuit on how the NHL should proceed with Ribeiro, especially in light of the Slava Voynov domestic violence case. He also noted how Predators general manager David Poile generally is often cautious when it comes to signing players of questionable character. Poile simply isn't the type of GM to compromise his morals in the interest of winning. His track record speaks to exactly the opposite, frankly. So does an allegation of an incident three years ago rise to the level of warranting a suspension? In my mind, not yet, not without solid evidence, and that's where the legal process plays a role. You don't have to believe Ribeiro is innocent in this case to decline taking action at the present time; frankly, we don't know one way or the other. Did Ribeiro have problems? Yes. Is he reformed? Maybe. Are these charges, if true, disgusting and despicable? Absolutely. What happens here moving forward in regards to Ribeiro and his contract with the Predators and possible unrestricted free agency? That’s a tough call on too many fronts for the Predators and other NHL teams that requires even more research. As for Ribeiro the person, you just hope he has addressed his problems and is trying to move forward.